Sometimes in medicine, a new technique is developed that is so effective, it makes the old way seem barbaric by comparison. Enter pinhole surgery, a new procedure for treating receding gums. “It’s a much less traumatic procedure for the patient,” said Manhattan-based periodontist Dr. John Lanzetta. 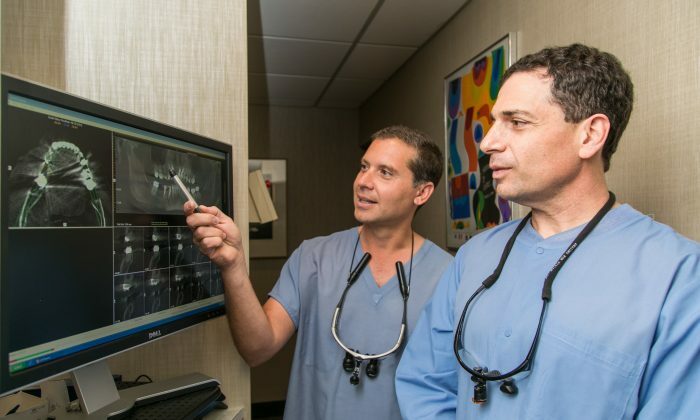 Dr. Lanzetta and his colleague, periodontist Dr. Chris Chondrogiannis, now offer pinhole surgery, also known as gum rejuvenation, at their practice, Madison Avenue Periodontics. They recommend it to all patients who want to treat receding gums. “We and our patients are very happy with it,” Dr. Lanzetta said. The procedure takes one to two hours, the gums look much better immediately, and the small holes close within 24 hours. The conventional technique for treatment of receding gums usually involves removing a strip of tissue from the roof of the mouth, cutting open a flap in the recessed gums, and suturing the strip of tissue under the gum flap and over the exposed roots. Sometimes doctors use graft material derived from human skin to avoid cutting the palate, but it’s still an extensive surgery. Pinhole surgery restores the gums without cutting, stitching, or grafts of any kind. The dentist makes a pinhole the size of a ballpoint pen tip in the recessed gum, and inserts a special angled instrument through the hole. The gum is then pulled down to cover the exposed root. Next, the dentist inserts collagen to hold the gum in place, until the body forms enough of its own collagen to keep the gums anchored. The procedure takes one to two hours, the gums look much better immediately, and the small holes close within 24 hours. Slight swelling may occur, but patients tend to experience very little pain afterward, which can be treated with over-the-counter pain medication. “There is virtually no post-operative discomfort,” Dr. Lanzetta said. This is impressive, considering a conventional procedure often requires narcotics and/or steroids for post-op pain, he added. For both conventional and pinhole surgeries, patients need to wait four to six weeks before brushing and eating normally. Many people find their receding gums unattractive and elect to treat them for aesthetic reasons. However, receding gums also come with health concerns. The roots of your teeth are not covered with enamel, but by a softer material called cementum, designed to adhere to tissue, not protect your teeth. So exposed roots are more likely to develop cavities, and they can also be sensitive to hot, cold, sweet, and acidic food and drinks. If the gums recede extensively, bone loss results, and this may lead to periodontal (gum) disease. Pinhole surgery requires no incisions or sutures, which means there’s a much lower risk of complications. In addition, a whole arch of teeth can be treated in a day—something nearly impossible with grafting surgery, Dr. Chondrogiannis said. Pinhole surgery is ideal for people who have gum recession caused by brushing too hard or grinding their teeth, or even resulting from previous orthodontic work. If gum recession is caused by gum disease (periodontitis), treating the disease is the primary concern. Laser gum surgery can efficiently treat both the disease and bone loss. Usually, when receding gums are treated with either procedure, they won’t regress. “With proper post-op maintenance, the results of pinhole surgery can last a lifetime,” Dr. Lanzetta said. The Pinhole Surgical Technique was developed by Dr. John Chao, a periodontist and professor at the University of Southern California School of Dentistry. He first performed the procedure in 2006 and began teaching it to other dentists in 2013. There are still few dentists who can perform pinhole surgery. As of November last year, Dr. Chao had certified just 2,000 dentists worldwide.